Interact HRMS is pure Web/Internet application comprising more than 70 integrated applications that cover all aspects of Foundation Management, Core HR, Leave & Time Management, Payroll Management, and Talent Management. 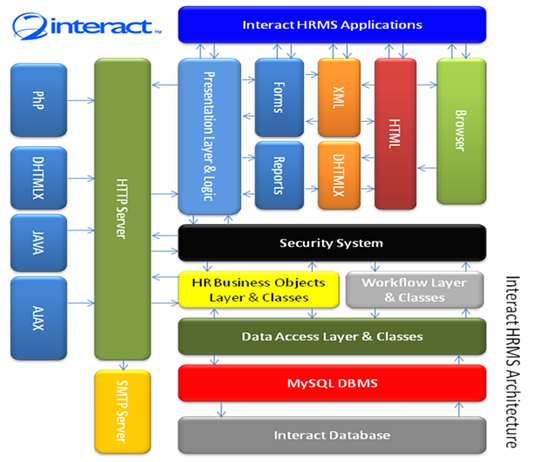 Interact HRMS uses layered software architecture, built using open source software development tools and database. Development technologies used to implement the said architecture include PhP, DHTMLX, CSS, XML, Smarty, HTML, Ajax, and MySQL Database. Object Oriented Design and Programming is extensively used to share components and optimize code for performance and efficiency, and Rapid/Agile Development, Testing, and Deployment. Presentation Layer – This layer is used to implement the User Interface to communicate between the User and the Application. The presentation layer consists of the forms, presentation logic, and reports and implemented using CSS, Smarty, DHTMLX, XML, HTML, and PhP. Security System Layer – Used to provide security and access control services to all applications. And supports Granular Access Control, and implemented using PhP. 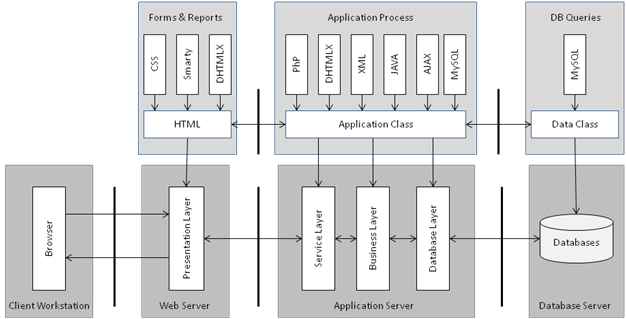 Application Business Objects Layer – This layer is used to implement the business logic of each application. Each application has its business logic classes implemented using PhP. Workflow Services Layer – A set of workflow classes that are used to implement workflow services, which are use by all applications for review and approval and associated processes and tasks. Database Access Layer – Used to provide database access to all applications and supports multiple databases access. System Classes – This consists of System Commons, DB Access, Login, Admin, Validation, License Verifications, and other classes. System Commons are consumed by the Application Common, and the Applications Classes. Application Common – These are the common classes that are used by all applications across the system and consists of Basic Functions, Menus, Styles, Charts, DHTMLX, and other app components. Application Classes – These are the Application UI and Business that implement the business functions of each application and the UI of each application. Includes – These are all the configuration files of the system and are used by the system classes and application classes. Interact HRMS Software Architecture is a Layered Architecture that is implemented using Object Oriented Design and Programming supported by a set of OO Classes that implement specific layers of the Architecture. This simple design is the basis for Agile Development that enables 2Interact to produce efficient, seamlessly integrated, high performance, and reliable applications in an optimal time.